The second, also self-titled album by Crystal Castles was recorded in such places as a closed church in Iceland or a cabin in Ontario so it is natural that coldness penetrated these tracks for good. Vietnam is the best example of the new sound of the duo: a spine-chilling tale of terror with some icy synths, frigid electronic backing and unintelligible vocals. The Game Boy noises so audibly present on the previous effort are hard to find. 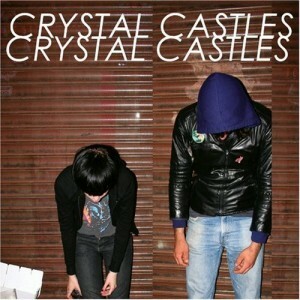 Crystal Castles (2010) is much darker than its predecessor and it is a quite depressive affair. On every level, Alice and Ethan step forwards. Year of Silence is what you would expect from Sigur Rós’ Jónsi if he died and dug out of his grave as a singing zombie. Violent Dreams is ethereal and this kind of slumber that leaves you with unidentified anxiety. On I Am Made of Chalk Alice gurgles, I must cite Pitchfork, like the monster from J. J. Abrams’ Cloverfield. It is really disturbing as you cannot say if she is in pain or in rapture. Not in Love is terrific as far as you listen to the remix with Robert Smith of The Cure. The best reason to hear the album is, however, Celestica. It feels out of place and CC are yet to outdo this sublime masterpiece which starts with the following lyrics As we fall into sequence / And we’re eating our young to come up to a disorienting plea of a lost soul When it’s cold outside hold me / Don’t hold me / When I choose to rest my eyes coax me / Don’t coax me. Among the most distinctive acts to appear in the second half of the noughties were Crystal Castles. They are not really famous for music but for their riot-like gigs. Alice Glass, the vocalist, would scream, run, climb, dive, spit, and who knows what else. Even a serious injury could not stop her from playing. She is the face of the duo but as usual in such cases the mastermind stays in the shadow. Ethan Khan, the producer, is responsible for Crystal Castles’ bleeps and jarrings. Their music often sounds as if taken from a Nintendo video game: primitive but charming (Untrust Us). Unless it’s aggressive as a band of yobs smashing your car (Xxzxcuzx Me). They rely heavily on samples and are fond of voice manipulation which should not come as a surpsrise. Crystal Castles are meant to polarise. It is nothing special, however, that what is a salvation for some, it is a heresy for others. But all of them will be taken by the closing Tell Me What to Swallow. Beautiful stuff.